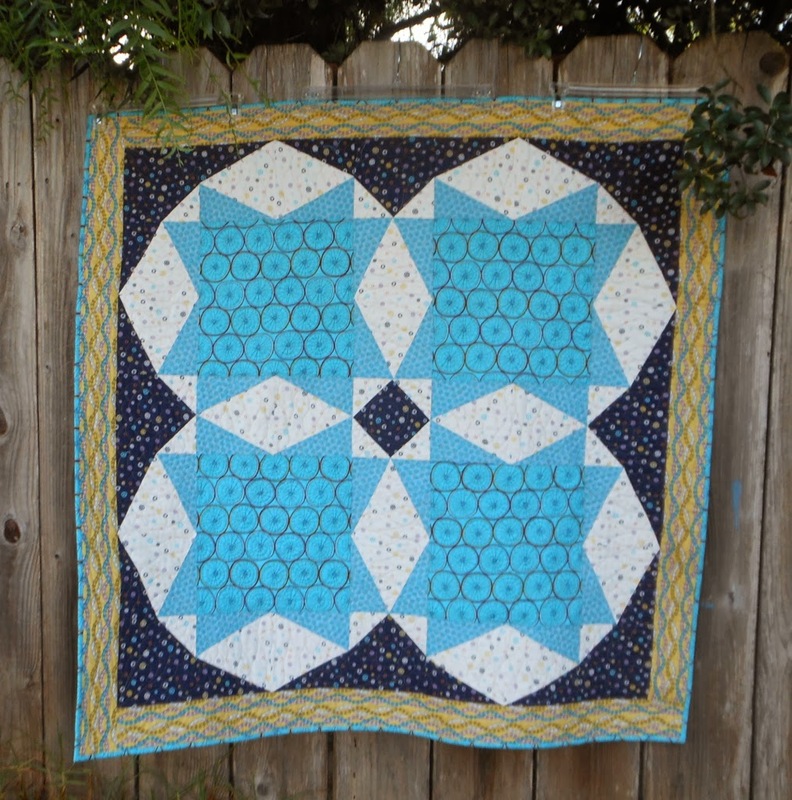 Vortex segment to trim to 8"
Back in 2009 I bought my first templates and a pattern after seeing this quilt at a show. I cut up all my parts, paired them between the sheets of a spiral and with little experience and great optimism began to sew. I was able to piece the inner curves without too much trouble but those outer tips frustrated me to no end, visited the LQS that I bought it at for help and I then finally gave up. If I were to do it today, I'd just cut them with excess to trim up when squaring and not struggle with exact placement. 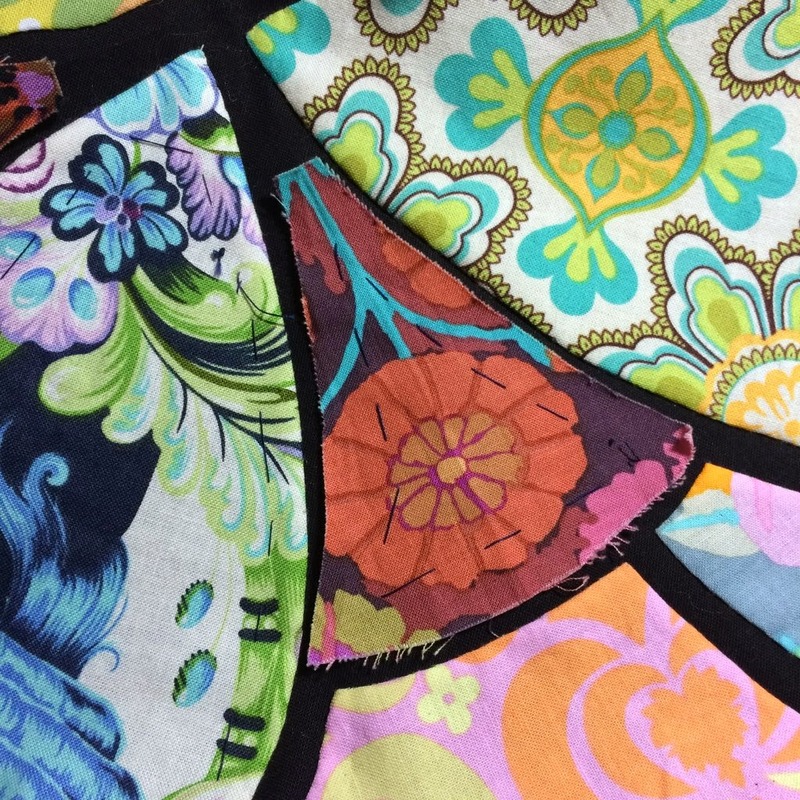 Pattern makers- why be so unforgiving? 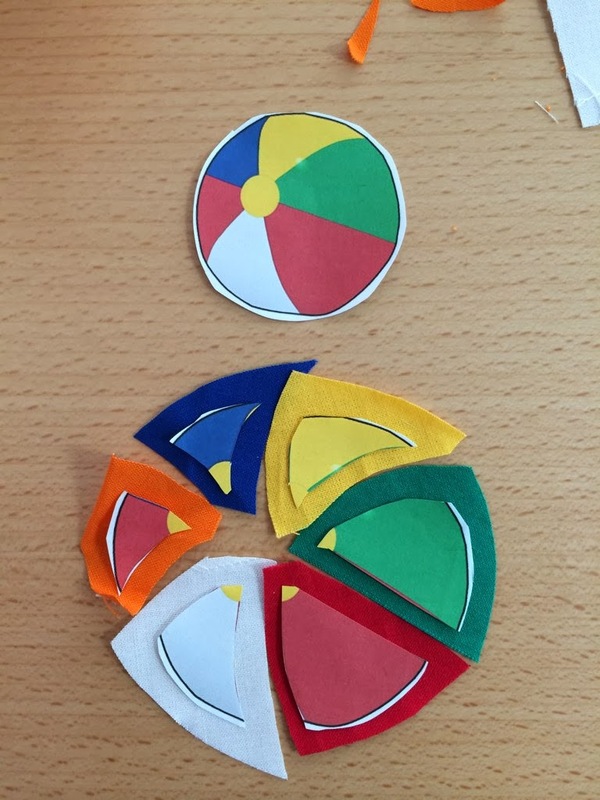 I have moved past the trauma of this initial fail with curves in large part thanks to the Quick Curve Ruler and these successful projects! 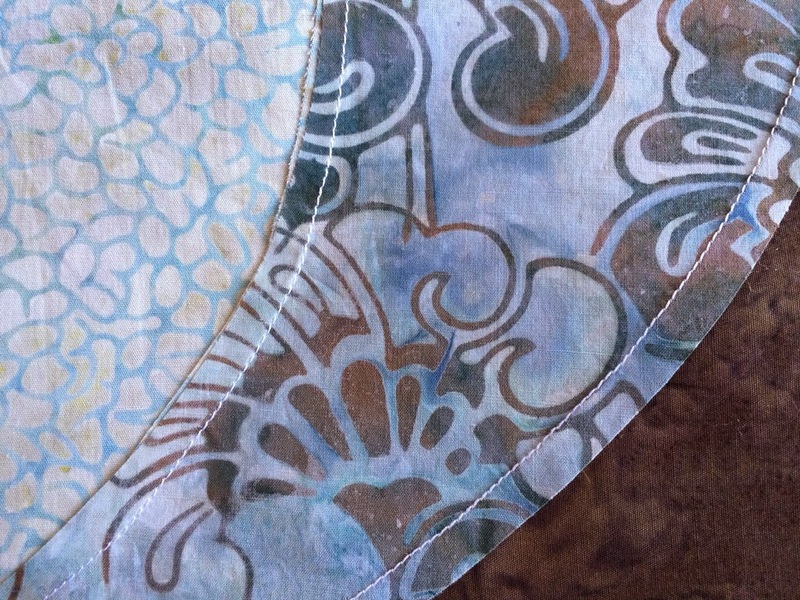 After using Aurifil exclusively for piecing I've become accustom to the nice thin discreteness of 50wt, the lumpiness of my old stitching feels so odd. I sure don't miss those long threads having been spoiled with a scissor button on my Symphony. I will also be pressing all one direction and I'm pretty sure I'll change up the layout. 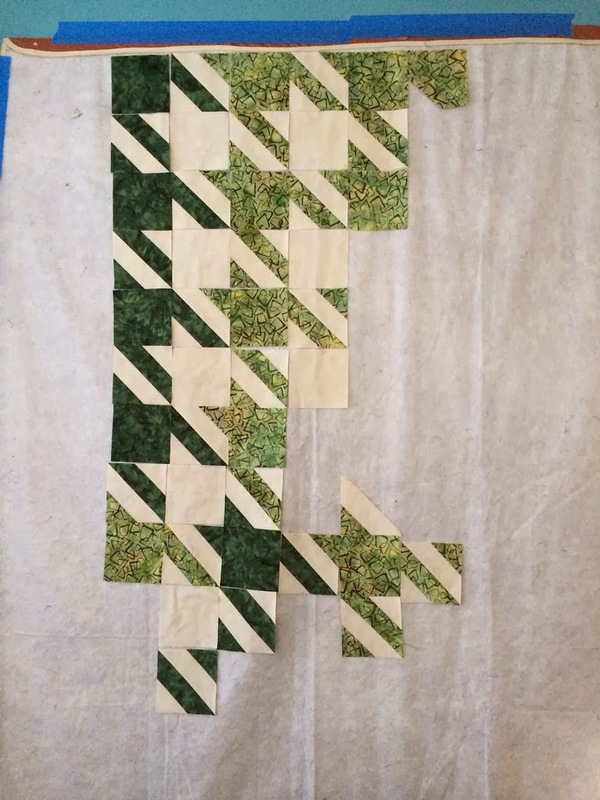 The houndstooth quilt that I've been putting off for nearly a year took a U-Turn. At least it wasn't a dead end like my last attempts to make my nephew a birthday quilt. Yesterday I took a break and got completely distracted with this old UFO and am trying not to trim the blocks up and play more today. We'll see. I decided to swap out the tan for a clean cream because my favorite fabric is the green print and the tan looked too muddy and didn't give the right support for it. The dark green looked really good with the tan but since it wasn't my priority I'm opting for this version. 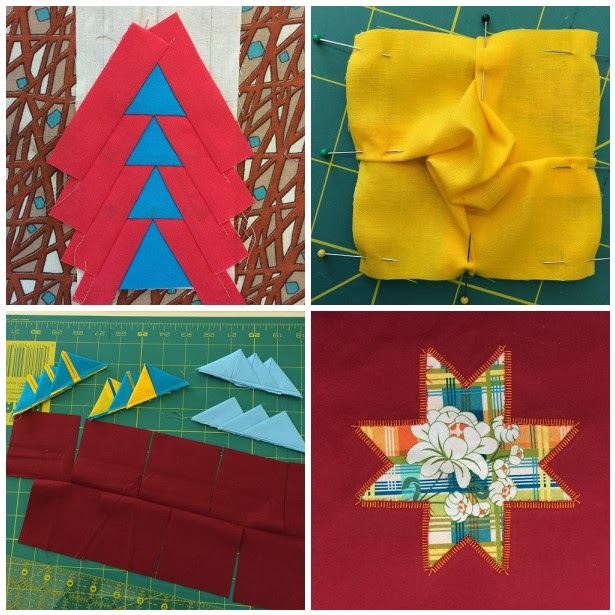 In quilting and design there isn't just one right way or option and it's time to move on. 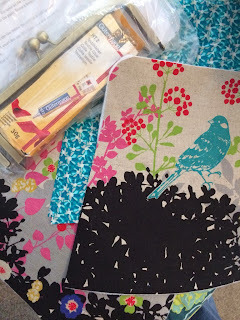 Linking up to Lee at Freshly Pieced for WIP Wednesday on Thursday. If it weren't for my link ups, I'm not sure I'd ever know what day of the week it was! 3rd Times the Charm or 3rd Strike? This project could go either way but regardless, it's going somewhere. 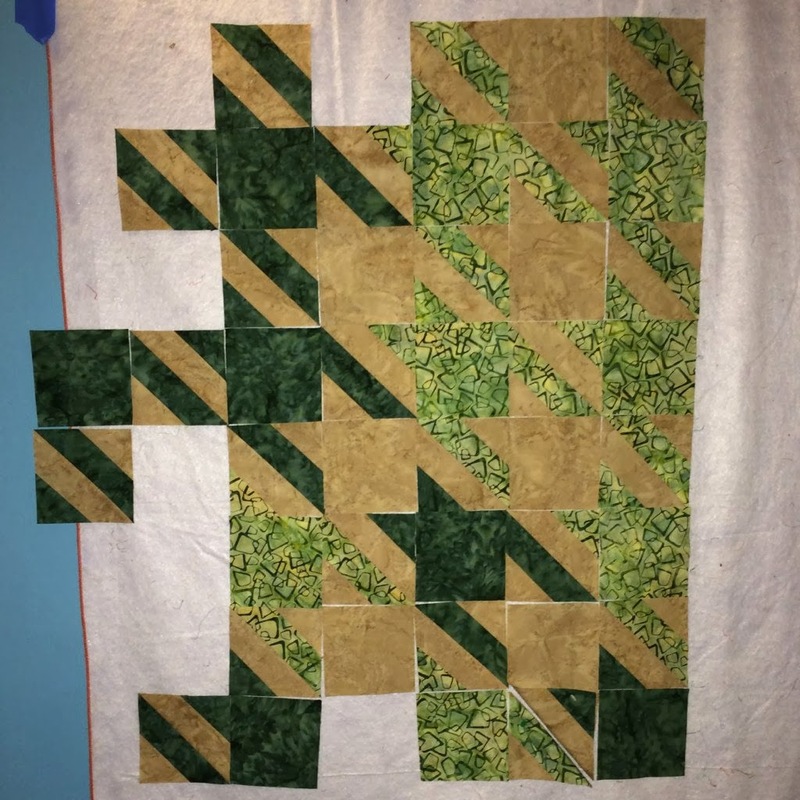 After ditching #1 the Labyrinth pattern and then abandoning #2 Japanese Jigsaw, I have committed to yet again another attempt at making my nephew a birthday quilt. May I present #3 Houndstooth. The lighting in my sewing room is atrocious so here's a shot in natural lighting. 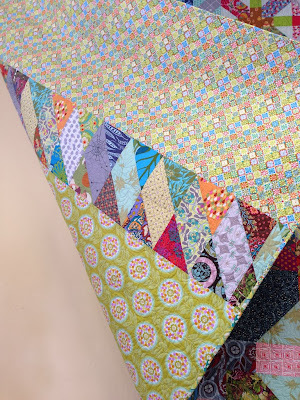 My inspiration came from this table runner I received from Anne@Play-Crafts which I just love. I've jumbo sized the blocks to keep them somewhat to scale. 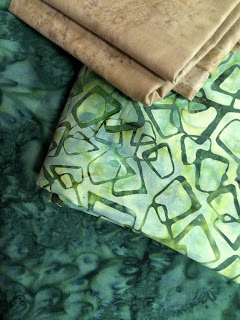 He wanted greens in batik and an Escher influence. The actual layout is yet to be determined and I'm pretty sure I just have to toss in a few light cream ones for a pop. Restricting myself to 3 fabrics is torture. 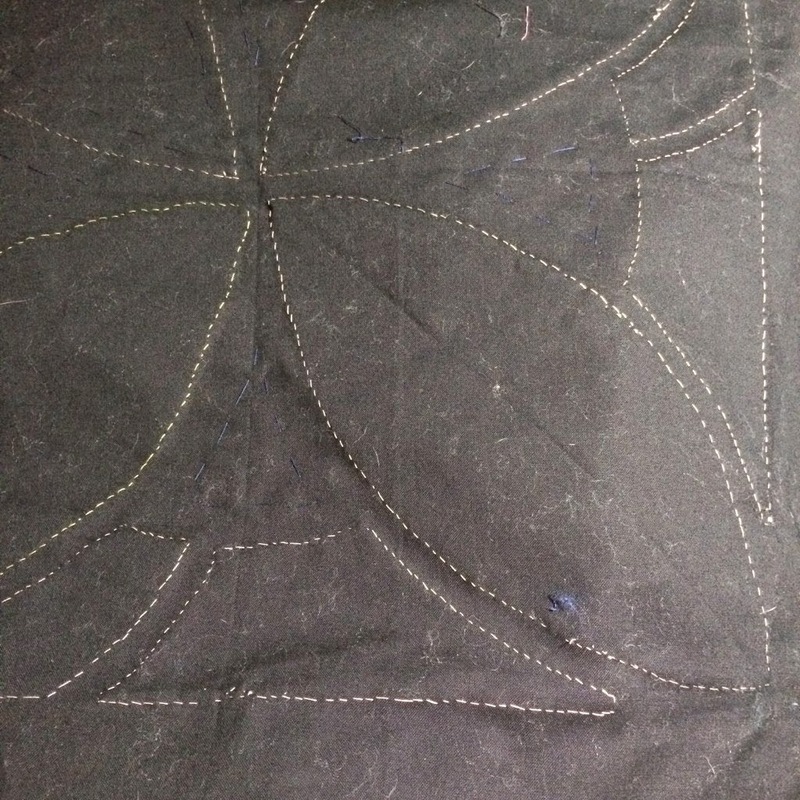 The three guy quilts that are all tardy have been a creative black cloud hovering and I'm starting off the New Year tackling them face on. 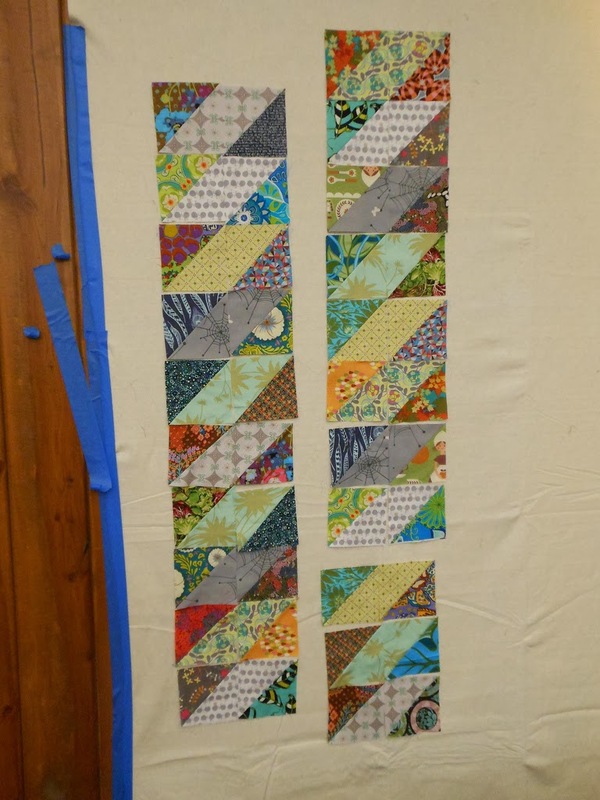 Here's a scrappy stack I put together because I had to play with lots and lots of choices to offset the limited 3 I am working with. 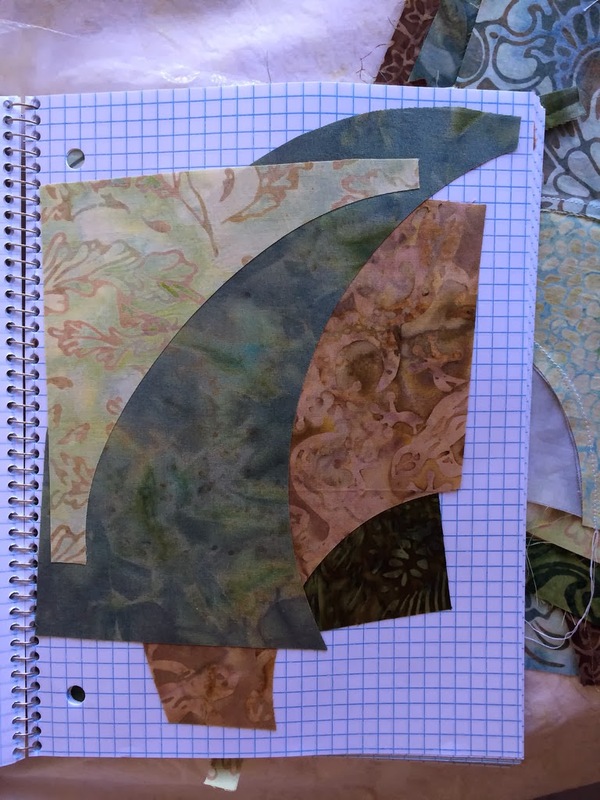 On Saturday I took a workshop called Best Machine Techniques with Cathie Hoover. It was nice to simply learn how to do a number of things rather than expect to walk away with "something" or more accurately, "something to finish". The biscuit block kind of cracked me up and I'll have to research the history of it. 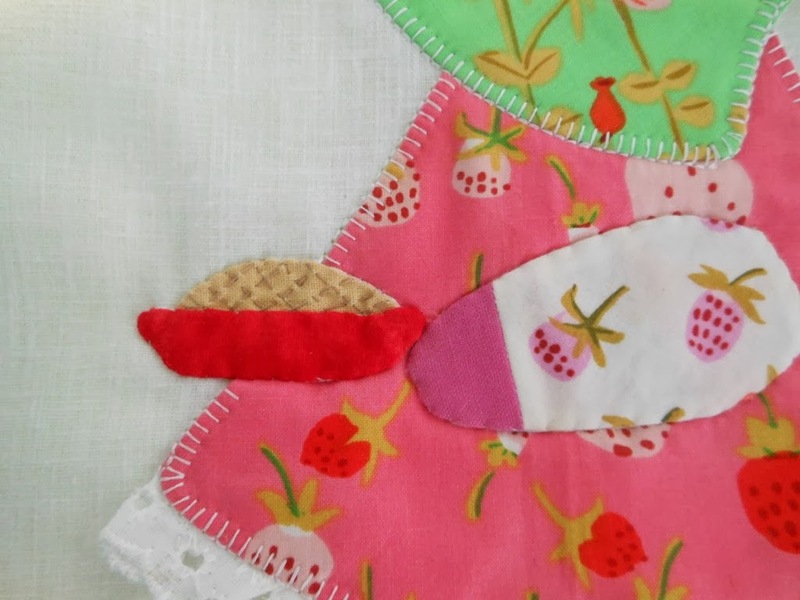 Before having a baby grand girl I wouldn't have thought making prairie points and sewing on rick rack would ever be a part of my quilting arsenal but texture and cutesy has it's place for little ones. The reverse appliqué is slightly different than I'd tried and I'm excited about that. 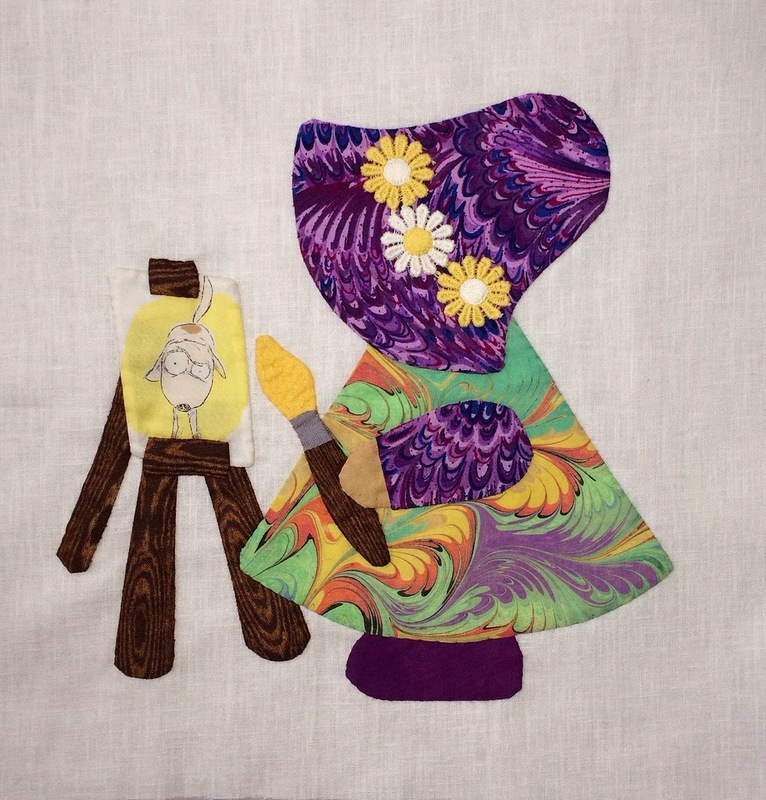 Speaking of appliqué, I also made great progress on my needle turn project from a previous workshop. I've decided to turn it into a pillow for a birthday gift so now it has a purpose and a deadline. I took a picture of the backside to show what happens when you roll the block onto a piece of bamboo batting to store it. Next time I'll use flannel or maybe warm and natural instead and one of these times I'll bother to learn to hide my knots but for now i don't really care. 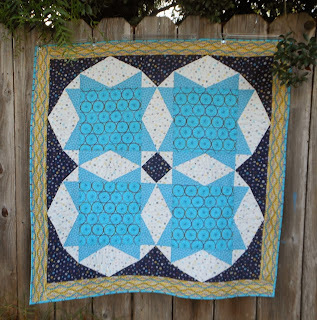 Linking up to WIP Wednesday at Freshly Pieced, hope you will too. I’ve got a few finishes that are a little different for me. 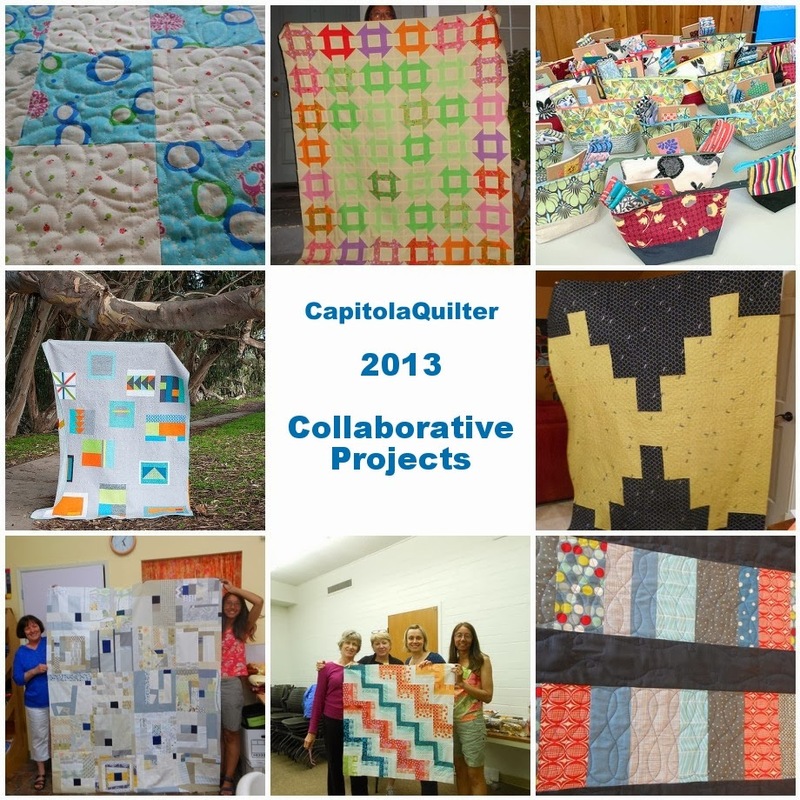 I find collaborative projects so rewarding and inspiring. It’s easier to get excited when working together don’t you think? 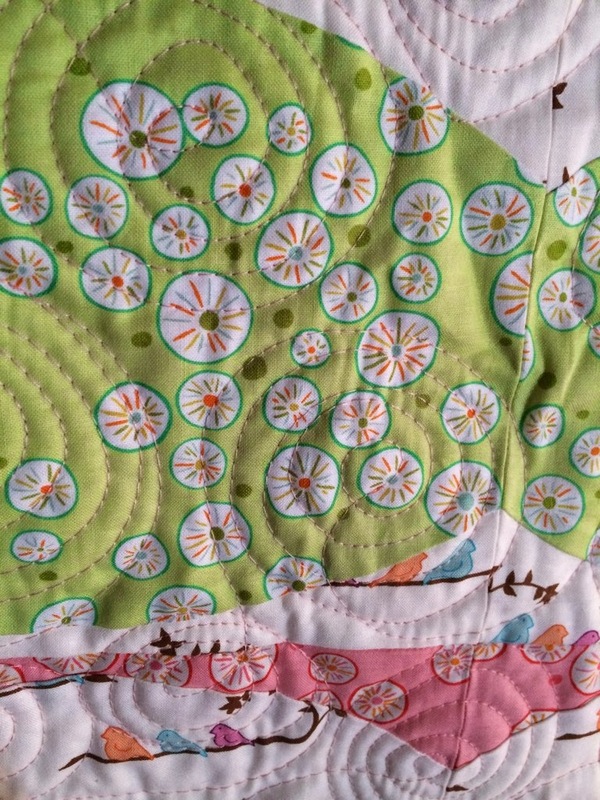 A tradition on my niece’s husbands side of the family is to make a Sun Bonnet Sue quilt for members who are expecting a baby. 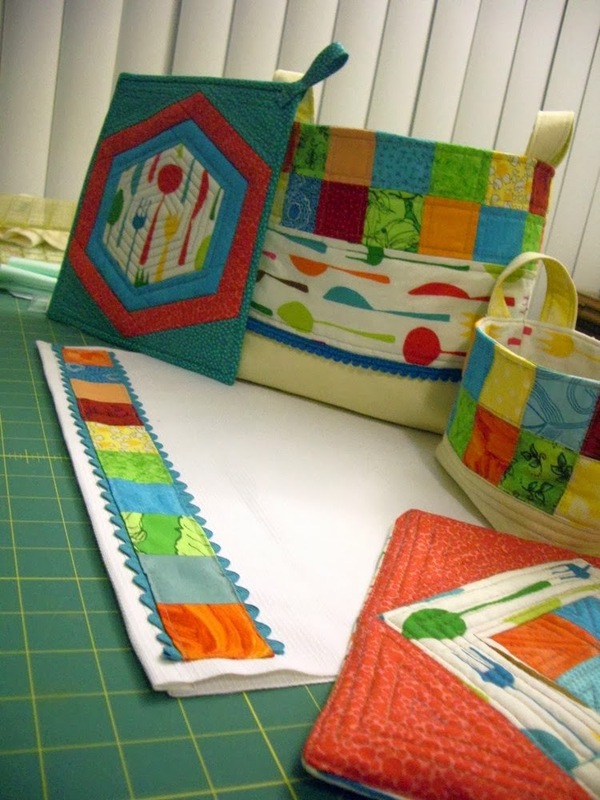 His aunt mailed out kits with the instructions, pre-marked interfacing and background fabric. Because it was a secret, I didn’t get to share the one that I made – until now. Personalizing it with fabric choice and a theme was fun. For her baby shower I made a moby-style wrap out of Briar Rose. I fussy cut a knitting bee for the bonnet (she crochets, close enough) She is also an amazing baker of pies. For her wedding registry she got Fiestaware so I included that detail. 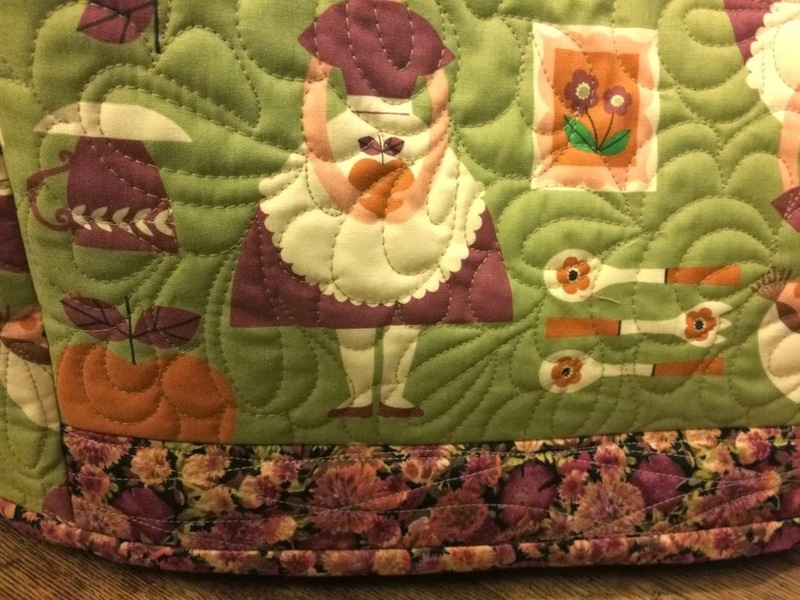 My machine and hand appliqué skills are almost non-existent but I did better than expected and even made a woven crust. 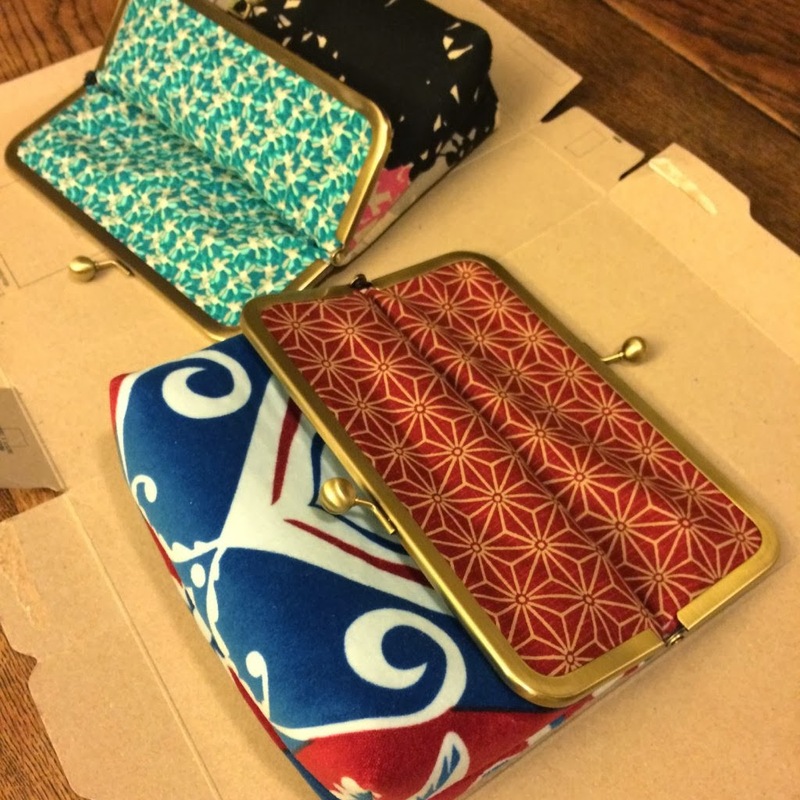 I had the opportunity to sew two more this weekend for my two sons to contribute. 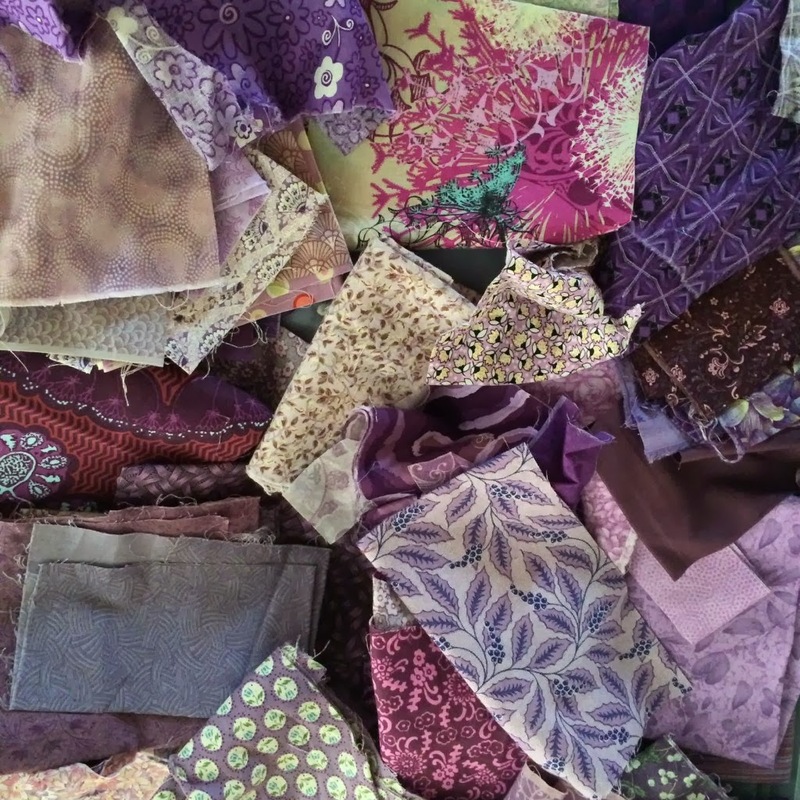 They came up with their own theme and pawed through my stash of fabrics to find each and every part. I decided to hand stitch appliqué this time. 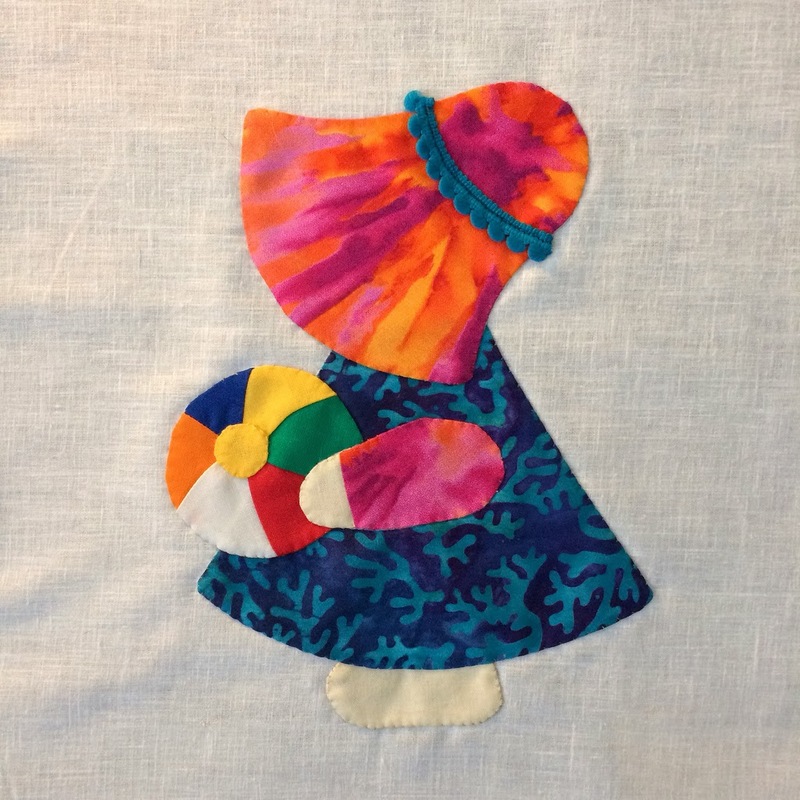 This one represents a barefoot Sue at the beach during sunset with an ocean dress and sky bonnet rather than literal images sewn on the background. The trim was left over from the scrappy kitchen basket I made for her Bridal shower. Note all the Fiestaware colors! I had them give me several options for “props” in case the execution didn’t translate. I was chicken of the beach ball so first I tried a sand bucket but the shovel looked more like a wine goblet – humorous but inappropriate for a baby. This one is an artist/painter with the easel the most challenging component to make. 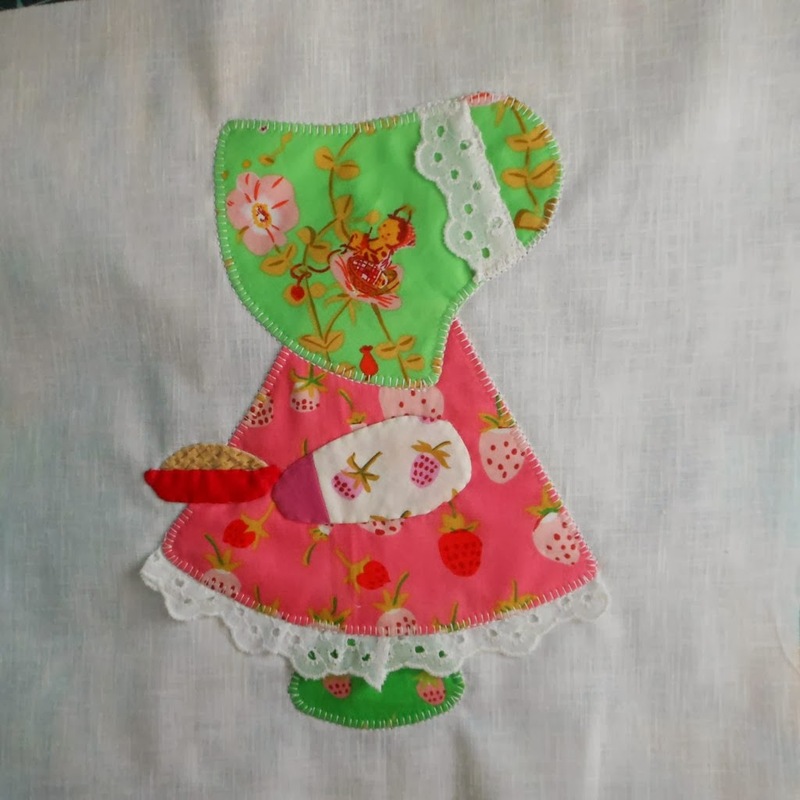 I was thrilled to use the vintage daisy trim from the thrift store. I made the front legs clubby on purpose to mimic the cartoonish style of Sue and yes, I did have walnut wood fabric in my stash. I’m happy to report that the baby the quilt is being created for made her grand entrance to the world this last week and everyone is doing wonderfully. Also finished this week is my January 2014 ALYoF goal. 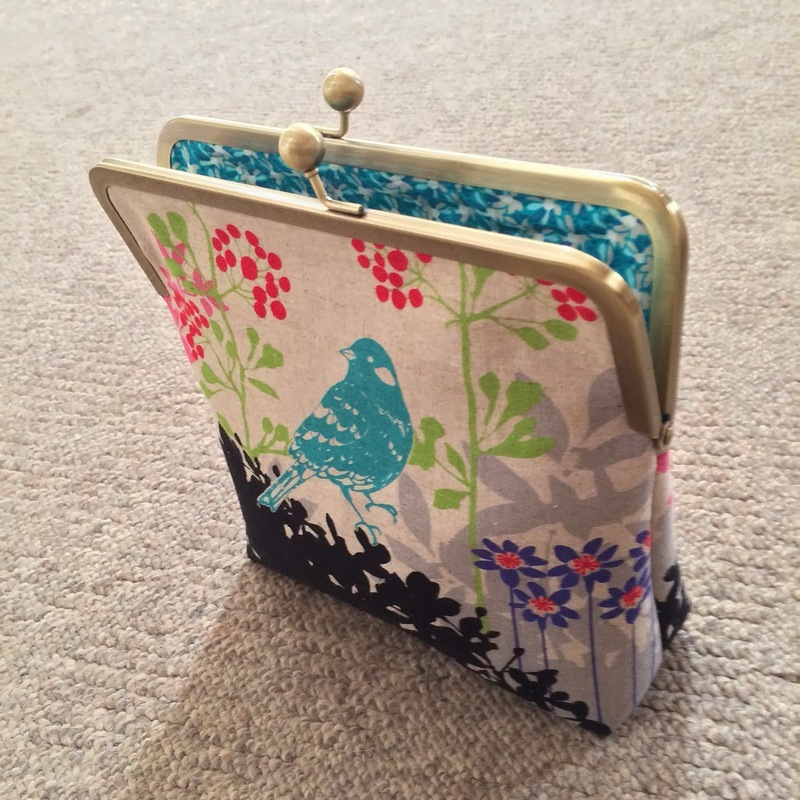 Our MQG is putting together a donation raffle basket and last year a sewed an Echino QAYG tote so this time I am putting in this clutch. I don’t know why it sat an entire year as a UFO – my friend and I got together and completed our projects in one afternoon. 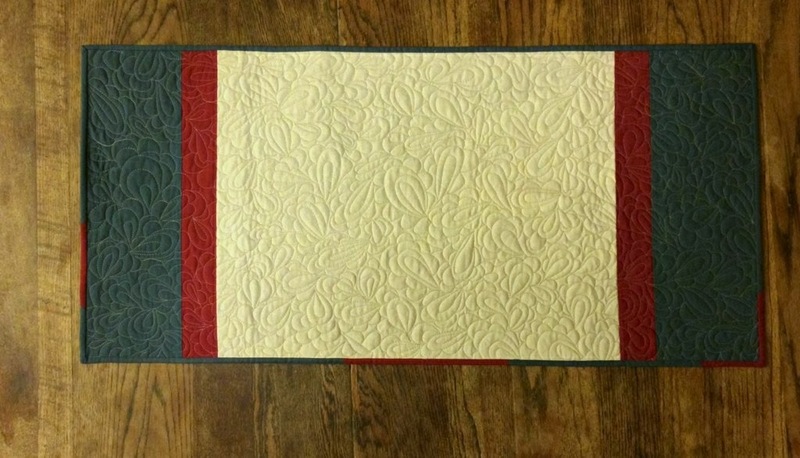 She made hers with AMH velveteen I had given her as a gift and turned out so pretty. I forgot to take a finished photo but you can see a sneak at the fussy heart front. Now for the Goals part of the post….My 2014 FAL Q1 mosaic and list. This was HARD - mostly because my “want to” and “need to” projects are not in alignment. OK I’m going to stop there because one of my New Years Resolutions on the Year-In-Review post was to include an attainable number of items in my link ups. I am including three that are from Workshops because I'm trying to follow through with what I'm learning so I can justify continuing to sign up for more (like the one tomorrow). 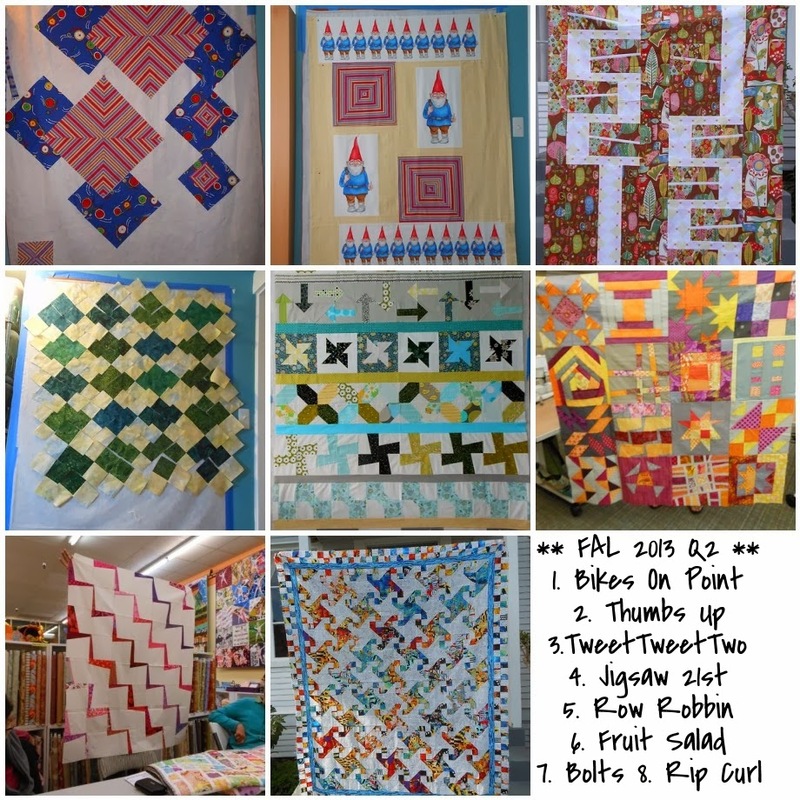 Linking up to Finish it Up Friday with Amanda Jean at Crazy Mom Quilts and to the Goal Setting party 2014 FAL Q1 with Katy at The Little Thistle. 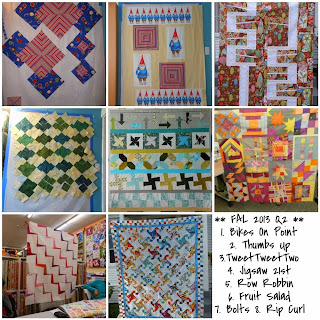 Last year my finished quilt tally was 13 and this year I wound up with 23. Six that I kept, 8 were gifted and 9 donated. 2014 felt very full and when I sat down to do my recap mosaics it hit me why that was. If I had to pick a favorite or two I'd say xPlus and Ring Around the Briar Rosie but Tassels is in there too. 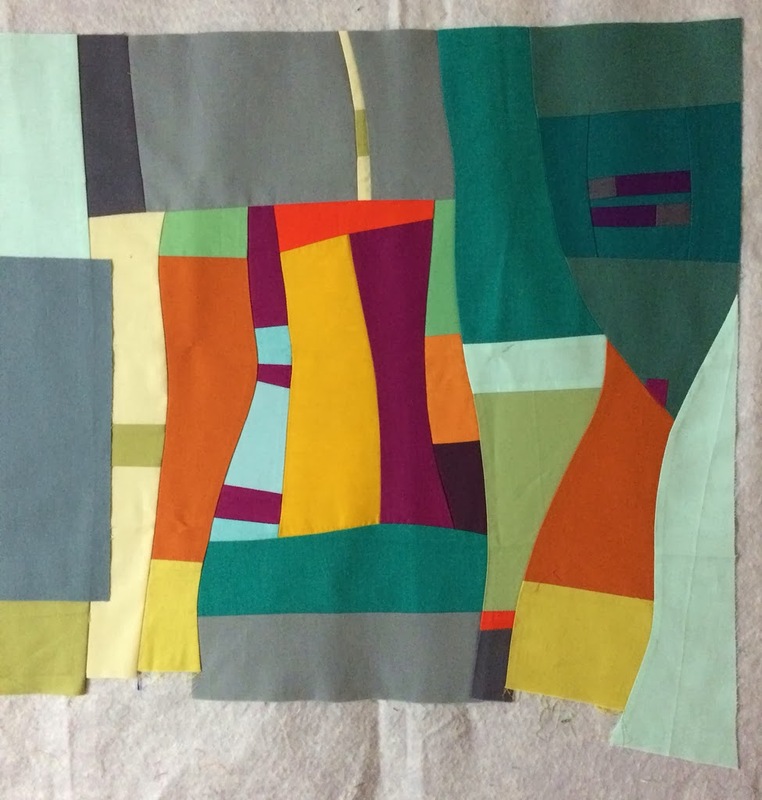 Procrastinating comes naturally for me and then today I finally decided that I would take the same approach to my Year-in-Review post as I do to my quilting: finished is better than perfect. So I'm sure I left a few things out but hopefully critical. 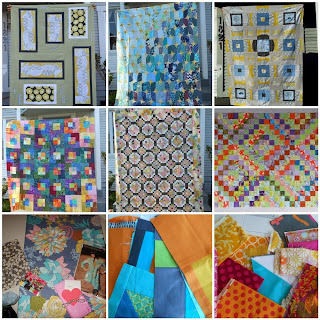 I found that making items that are not quilts now and then is good for me! A few new categories that I hope to expand on in years to come. 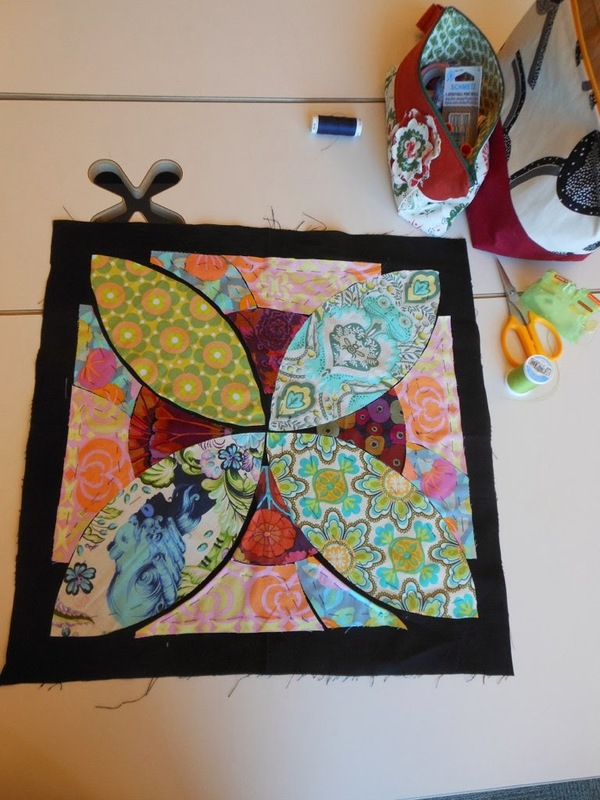 Collaborative quilting is so rewarding and I would like to do more. 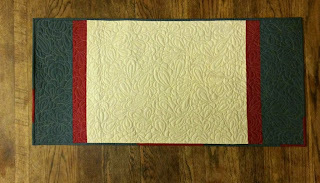 The Free motion quilting of our MQG QuiltCon quilt was challenging and worth every nervous stitch. A couple of tunics and a baby dress doesn't seem like a big deal but for me getting over the garment hurdle was huge. The birth of my baby grand girl and becoming a Grammy for the very first time was the tip top highlight. She is such a joy and I've found that my blogging has become more personal since her arrival. I joined the modern age of social media with my first smart phone, mostly so we could do selfies! 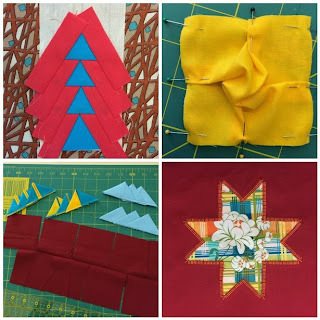 The MQGs Retreat and Charity drive were quite memorable as was rubbing elbows once again with Heather Ross (I'm going to her workshop in Palm Springs this month - aren't you jealous!). 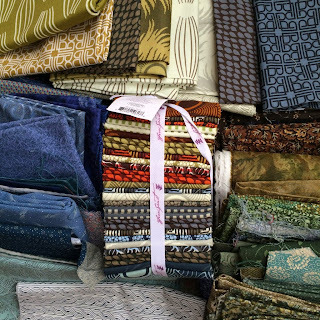 Redoing my sewing space completely and boarding my fabric had a big impact although it remains work in progress. 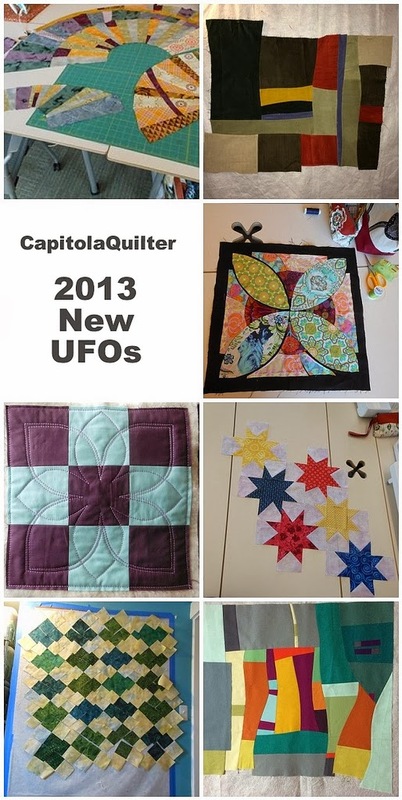 Ending the year without an enormous pile of new UFOs makes me very happy. 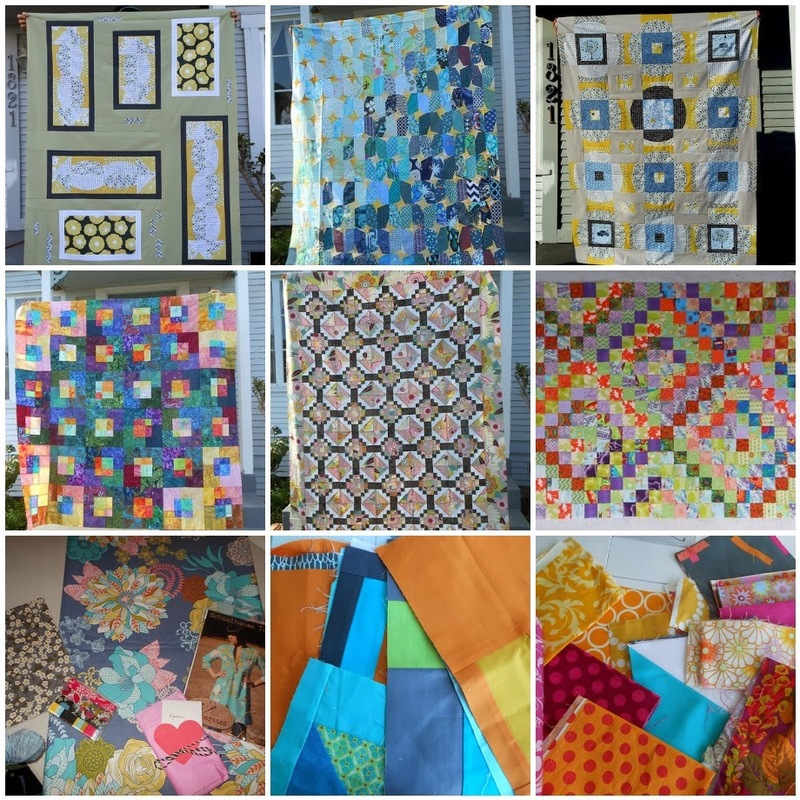 Link up at least once a month to WIP Wed and Finish it Up Friday - because they're fun! 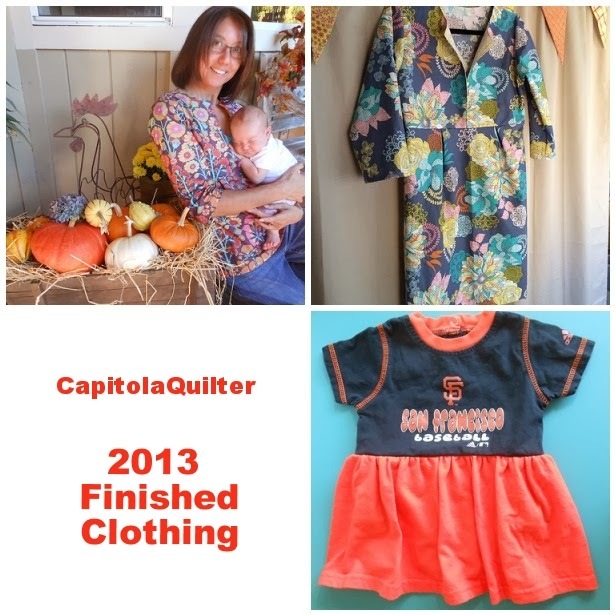 I'm linking up to Year-in-Review , have you? Bonus triangles, a photo by capitolaquilter on Flickr. 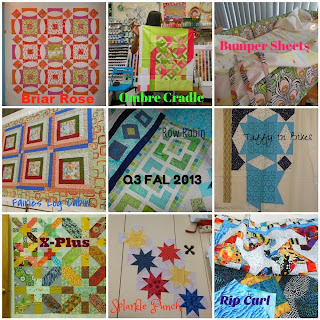 One last post before I compile my Year-in-Review with a look back at the goals and completions for 2013 FAL including Q4. I consider my xPlus a "Special" quilt deserving of more than a plain backing so it was a perfect choice to use my bonus HSTs (see tutorial) The stack was put to good use bridging these two similar green backings and bringing many of the fabrics from the front to relate for cohesiveness. I grouped the lights to the center, staggered to avoid too many of one color way together and originally considered putting two partial strips but liked one full length one instead. 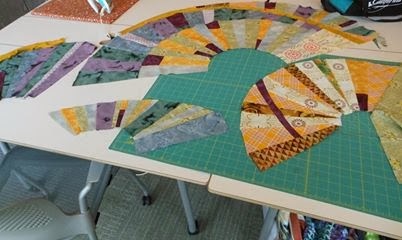 The quilt is still hanging at my LQS so I'll have to add a full shot later when it comes home. 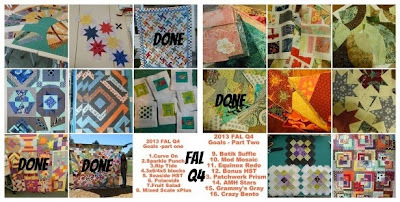 Tally: Twenty-Three projects that might not have otherwise gotten done - Thanks FAL! Jigsaw and Sparkle Punch were abandoned early on. A few but not all of the dozen unfinished from this quarter will join those in my UFO bucket but some like Polaroid and Get Your Curve On I hope to still tackle. 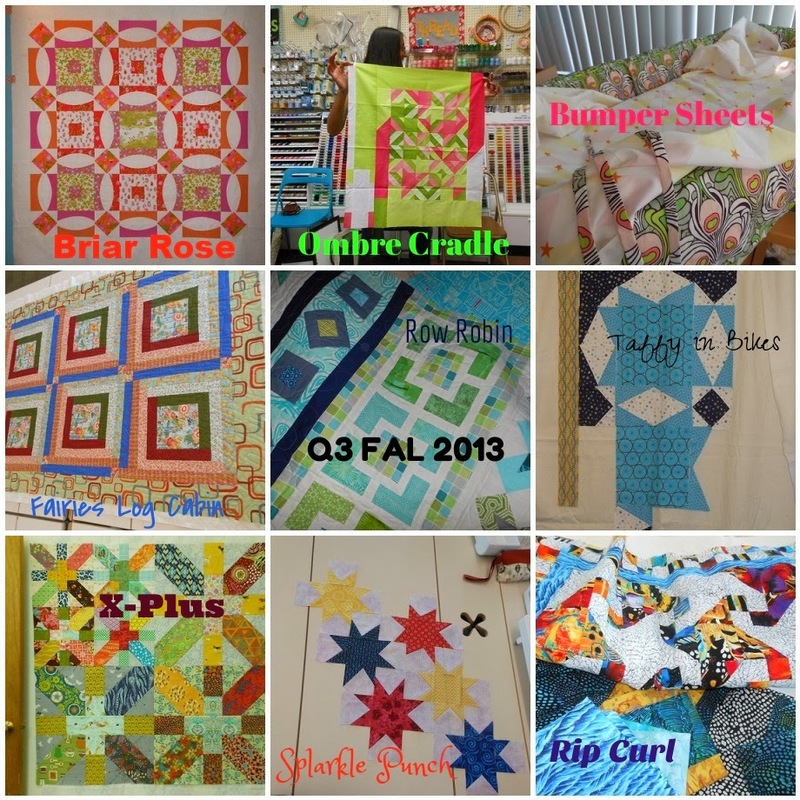 Linky time for 2013 FAL Q4 Finishes and don't forget to set your goal for 2014 Q1 FAL. I'm definitely going to participate again after reflecting on how many things got accomplished. Be sure to also check out the guest tutorials at SheCanQuilt including Anne@Play-Crafts latest of her Color Theory series featuring the topic of Contrast. One item will be on the list for sure and that's my January 2014 ALYof goal. 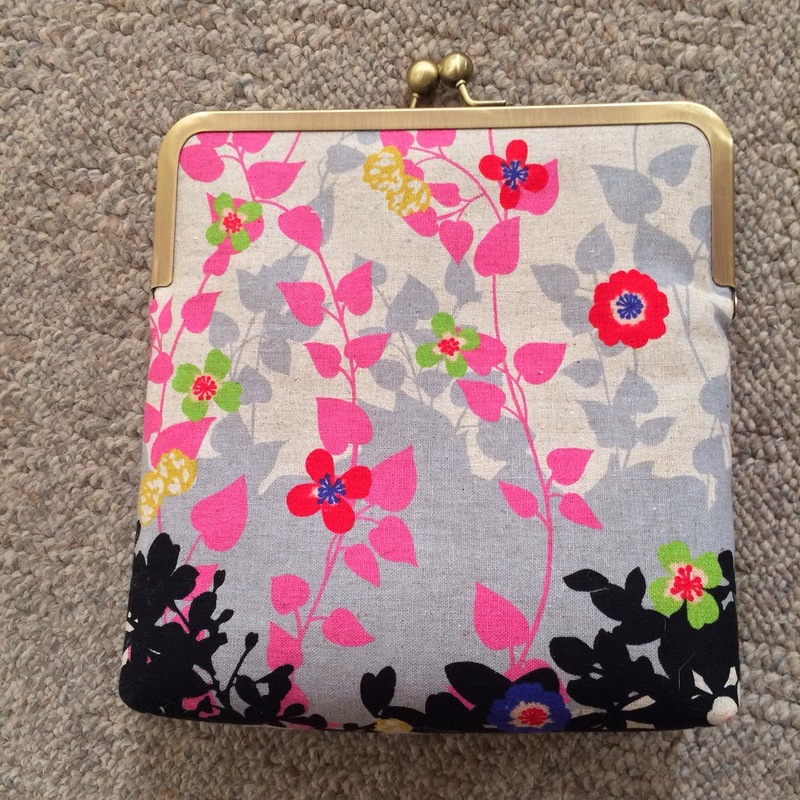 This Echino clutch has been sitting since this time last year all cut and fused ready for sewing and gluing. This is my 199th post and I'm determined to make my 200th a Year-in-Review so stay tuned! 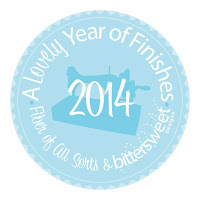 A Lovely Year of Finishes 2013 - Seven Successfully Linked Up ! 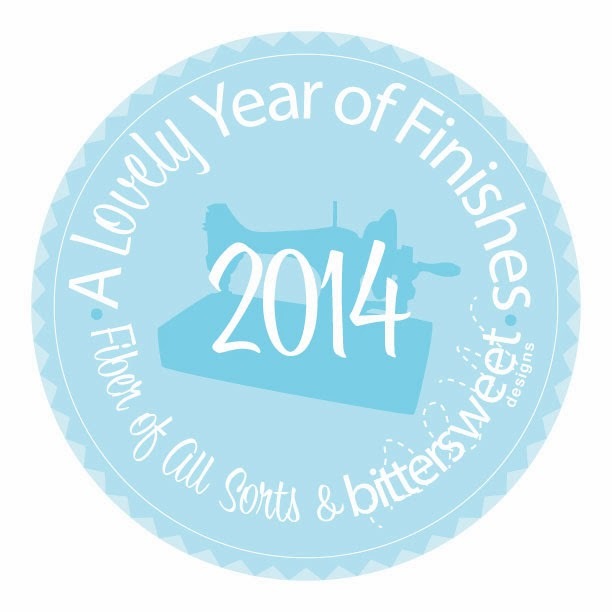 A Lovely Year of Finishes 2013 - Six Successfully Linked Up !, a photo by capitolaquilter on Flickr. May I present to you the six seven qualifying finishes all linked up as goals and finishes for ALYoF year long party: Tassels, Tweet Tweet Twist, Tweet Tweet Two, Cradle Set, Schoolhouse Tunic and Rip Curl and last but not least Tire Rotation. edit: Tire Rotation was my Sept goal and I linked up in time but titled it without my name so when I searched the finished party page it couldn't be found. Then I located this blog post celebrating the on time completion. 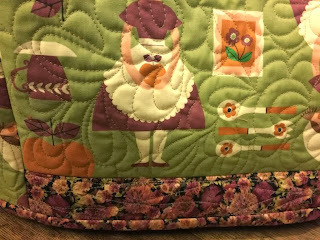 As I mentioned before xPlus was my November goal and I finished, blogged but then forgot to link up - because I was SO burned out. Seven Eight would've been nice but I'll settle for these six seven for the FINALE Party. Be sure to check out the ALYoF flickr group and the 2014 Goal link up. Join in the fun and prizes and cheer one another on. December 2013, a photo by capitolaquilter on Flickr. 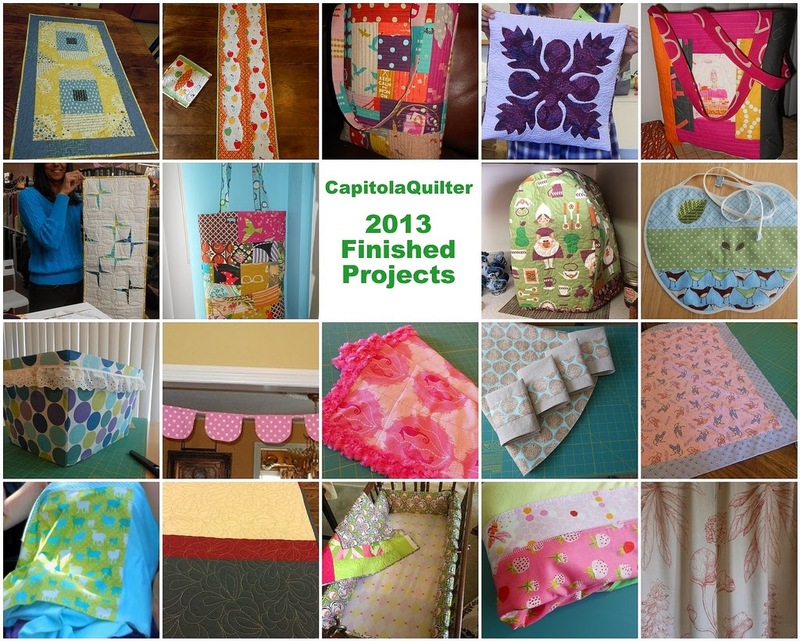 I'm happy to report that I gifted 3 quilts, 1 table runner and 1 Kitchen Aid mixer cover in December. My first Quilt Show is making an extended appearance through the month of January which means it'll be a bit longer before xPlus is on our bed and that might be good since it trashed my body FMQing and I haven't quite forgiven it. I got to play a bit with Improv in corduroy with high hopes of more to come. Mixed style FMQing and trying out different patterns in general was also fun. Wrapping up the year felt both rewarding - for having pulled off what I did - and frustrating - for not having started earlier. 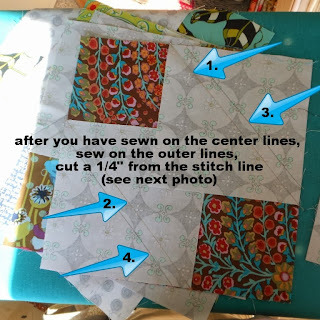 Linking up to Lily's Quilts Fresh Sewing Day December and to Finish it Up Friday with Amanda Jean at Crazy Mom Quilts with new projects start to finish competed and gifted - yeah. 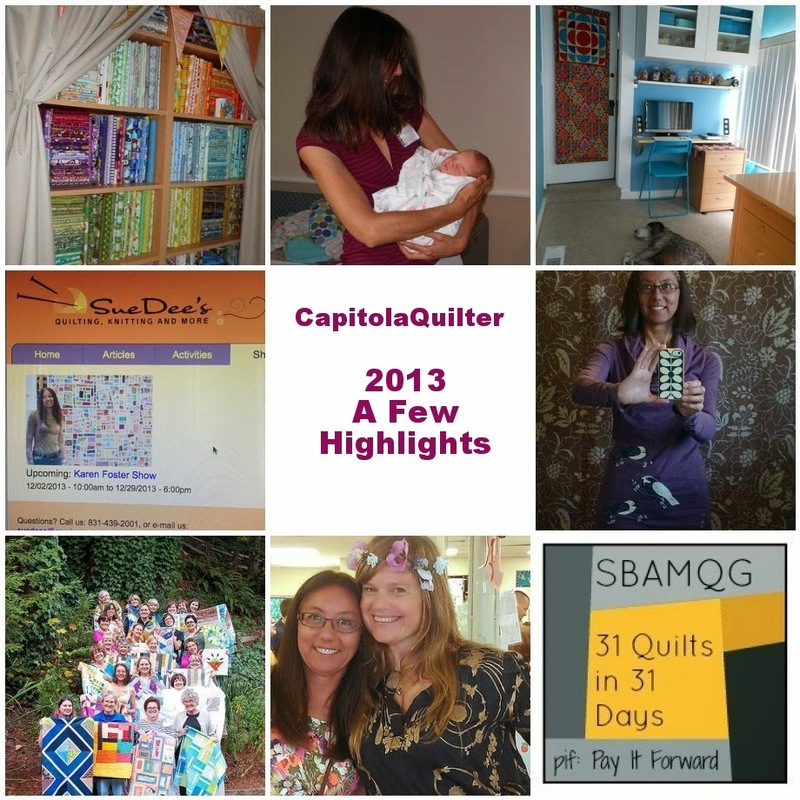 I'm hoping that making a 2013 recap post will be easier with the help of my Monthly Mosaic Set on flickr. Motivated by the joint Year-In-Review Linky Party at Play Crafts and Sarah Quilts, I'll be busy taking inventory and reflecting on highlights so that I can take my time hopping around- how about you?